The book has been completely rewritten and updated. 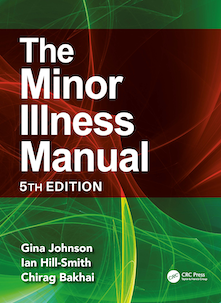 It now includes sections on drug side effects masquerading as minor illness and how to interpret and manage red flag symptoms. There are new infographics to help you to interpret clinical data, and flowcharts on managing acute conditions. Relevant prescribing information has been placed next to each recommended medicine. The NMIC formulary (which is currently being updated) is still available to view on the members' section of our website. The book contains a voucher for six months free access to the members' section of our website. The NHS of the future- diverse, adaptive and united. Introduction. Fever and Sepsis. Respiratory Tract Infections. Ear, Nose and Throat. Eye. Neurology. Skin. Abdomen. Women's Health. Mental Health. Musculoskeletal/injuries. Management of Minor Illness. Prescribing for Minor Illness. Resources.